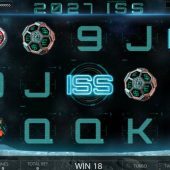 2027 ISS slot is an abbreviation that I correctly guessed when seeing it for the first time stands for 'International Space Station' and indeed this is the futuristic theme of the game. The reels spin and land with the bleeps you'd expect from the high-tech equipment used for this space travel and we have a background of the star clusters of the cosmos. So far so good, but can we expect a stellar performance from this game? We start with the standard 5 reels and 3 rows because there are only 9 pay lines which may indicate, alongside the developer Endorphina's name, that we have a high-volatility game here similar to their Diamond Vapor slot. This is certainly reflected by the Wilds appearing on each reel in the form of a lady astronaut's space helmet which multiply wins by 2x and pay 1000x bet for 5-of-a-kind. We have a spaceship roulette wheel and multi-faceted space orb which pay 83x stake for 5, then dice at 44x, cards in the form of a solar panel and a satellite at 28x and lastly the card values for 11 or 14x bet. The symbols all appear singly and we have the game's ISS logo as the scatter on all reels. This pays a considerable 500x bet for landing all 5 but you only need 3 to trigger the slot's quite excellent bonus round! When they land you get a countdown from the control center "Three, Two and (hopefully) One!" which triggers lift off into Hyperspace. Once the scatters have launched you into Hyperspace we begin a free spins round of unlimited games at 3x multiplier. Above the reels a fuel meter has 5 light blue spaces and you begin with 3. You may get a fuel symbol on reel one which pays 2x bet (effectively 6x bet with the 3x multiplier if effect) which will add one more cell to the meter. Conversely, you may see the red Hyperspace Jump icon on reel 5 which takes you and the reels through a space warp and consumes 1 fuel cell as it does so, also paying (6x) bet. They may land together and cancel each other out but you still get 12x bet. Once your fuel cells run out the bonus spins end. 2027 ISS slot has very good graphics and sound effects, neither of which will prove wearing to the player. 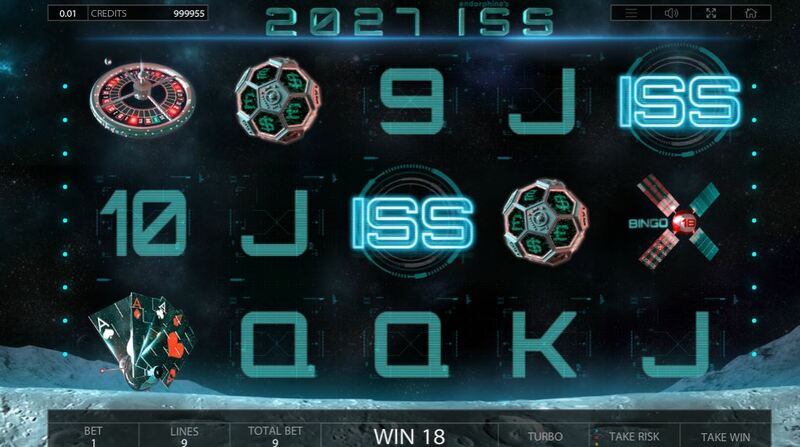 The outer-space theme is a popular one, examples being Space Race from Play'n Go and Microgaming's Galacticons, but this does not detract from the game. Despite the high volatility and win potential of 2027 ISS, the base game hits are far more frequent than I expected so my balance was maintained surprisingly well. The bonus rounds I saw never paid less than 100x bet although I can't promise you that! The RTP is factory set at 95%+ but the stand-out characteristic has to be those free spins which do last for quite a while thus accumulating good winnings even if you miss the better line hits. I'll definitely be asking Scotty to beam me up to this Space Station!